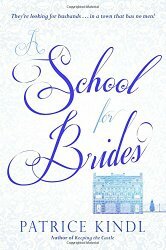 A School for Brides is a sequel to the delightful Keeping the Castle, but is primarily dealing with totally new characters, so you can feel free to read this book without having read the first. Like Keeping the Castle, this is a humorous and light-hearted tribute to regency romances. There's a quotation taken from Jane Austen's The Watsons at the front. The Watsons was unfinished, but is also the only Jane Austen book I haven't read, so I don't know if A School for Brides mirrors the plot of The Watsons the way Keeping the Castle mirrors the plot of Pride and Prejudice. I read this at an unfortunate time, having recently finished two other girls' boarding school books: The Scandalous Sisterhood of Prickwillow Place, by Julie Berry, and As Chimney Sweepers Come to Dust, by Alan Bradley. And try as I might, I didn't get too enthusiastic about yet another book with a large cast of characters and young ladies in a boarding school, so it took me a long time to read it. But there is fun to be had here. We're back in the delightfully-named village of Lesser Hoo, this time at a finishing school, the Winthrop Hopkins Female Academy. Girls have been sent there to find husbands. There's one problem: No eligible men live anywhere near Lesser Hoo. However, the problem is solved rather quickly when a gentleman suffers an accident near the academy, and must be taken there to recuperate. Of course his friends come to visit him in his convalescence, and couples happily pair off. There are some surprises and obstacles. A wicked governess tries to interfere with one of the students, and some of the suitors are not so acceptable as one might wish. There is also a mystery, as promised in the subtitle, when a valuable necklace disappears. Is the thief the handsome footman, Robert, who is under suspicion simply because he's a servant? Well, the reader will suspect not, but how then was the theft carried out? "Mark my words. If something drastic is not done, none of us shall ever marry. We are doomed to die old maids, banished to the seat farthest from the fire, served with the toughest cuts of meat and the weakest cups of tea, objects of pity and scorn to all we meet. That shall be our fate, so long as we remain in Lesser Hoo," said Miss Asquith. Extravagant as Miss Asquith's mode of expression was, her fellow scholars at the Winthrop Hopkins Female Academy could not help but feel that she had a point. They nodded in solemn agreement, and Miss Victor, who was only twelve, began to cry. The other young ladies frowned and attempted to turn and regard Miss Victor with disapproval at her outburst. This was rendered difficult by the fact that all eight were bound to backboards, wooden devices that forced their necks and spines into an erect posture. The backboards required them to rotate their entire upper bodies when they wished merely to turn their heads. This book gives you light-hearted romance, lots of couples, a ball, and missing jewels. Lots of fun.